Posted by grhomeboy in Greece News, Greek Culture Heritage, Special Features. Celebrations in Kalamata marking the 187th anniversary of the city’s liberation from Ottoman rule culminated last Sunday night with an official dinner in honour of President of the Republic Karolos Papoulias hosted by Kalamata Mayor Panagiotis Nikas. The dinner was also attended by Archbishop Ieronymos of Athens and All Greece, government Ministers and local Municipal and prefectural authorities. Addressing the President, Mayor Nikas thanked him for honoring the event with his presence, stressing that Kalamata’s liberation meant a lot for the liberation struggle, as Kalamata was the first city to rid itself of the Turkish yoke. In his return address, President Papoulias said that the anniversary celebration “fills our hearts with strength and passion for the safeguarding and preservation of our freedom”. In honoring all those heroes who fought for the national dignity and independence, one must draw from their sacrifices the necessary teachings to carry on, in these difficult times, on the steadfast national course, Papoulias added. The President said that a catalytical factor in the 1821 Revolution was “the faith in the sacredness of the struggle, and the power of the passion inspired by the justness of that struggle”. “It is our obligation to safeguard and make use of this precious heritage. It is our obligation to be prepared for sacrifices, individual and collective, to face the difficult circumstances today, and to prove that we are conscious of our country’s great and historical responsibility to the future,” President Papoulias concluded. Posted by grhomeboy in Greece News, Special Features. The 187th anniversary of the 25 March 1821 Greek Revolution, which marked the start of its war of Independence against Ottoman rule and the birth of the modern Greek Nation, was celebrated throughout the country on Tuesday with school parades in every town and district, as well as a grand military and security forces parade in central Athens that was held in the presence of President of the Republic Karolos Papoulias. Earlier, President Papoulias had also attended a celebratory mass at the Athens Cathedral for the twin holidays of the Independence anniversary and the feast of the Annunciation of Virgin Mary, both celebrated on March 25, that was led by the Bishop of Fanar Agathonikos. 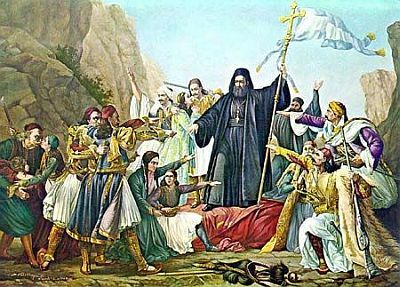 Archbishop of Athens and All Greece Ieronynos was unable to lead the mass following an accident that resulted in a broken ankle, for which he was being treated in hospital. On his arrival at the Cathedral, the President was received by Prime Minister Costas Karamanlis, Parliament President Dimitris Sioufas, Athens Prefect Dimitris Sgouros and Athens Mayor Nikitas Kaklamanis. 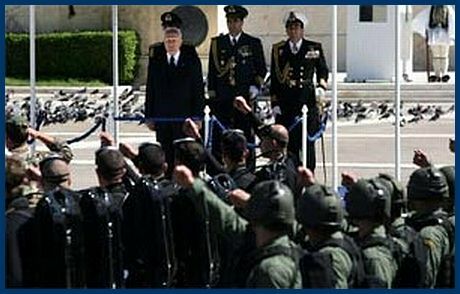 Prior to the start of the parade, President Papoulias deposited a wreath at the tomb of the Unknown Soldier outside Parliament and observed a minute’s silence in honour of the freedom fighters of 1821, after which an mixed honour guard fired a volley of shots and cannons were fired from Lycabettus Hill. The President then inspected an honour guard and greeted the political, state and military leadership before taking his place on the officials’ stand to watch the parade, alongside the Prime Minister, the Parliament President, and other state officials. 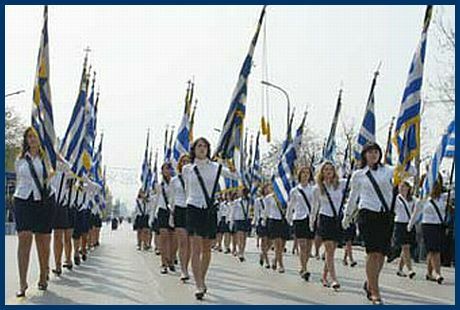 The Presidential Guard known as “Evzones” on parade, during the March 25 Independence Day anniversary parade. The customary annual military parade was led as always by the wounded veterans of war, the 1974 commando troops that fought on Cyprus during the Turkish invasion, and the Greek Red Cross, followed by the units of the Army, Navy and Air Force, Greek Police, Fire Brigade and Coast Guard, while military and fire-fighting aircraft and helicopters flew overhead. 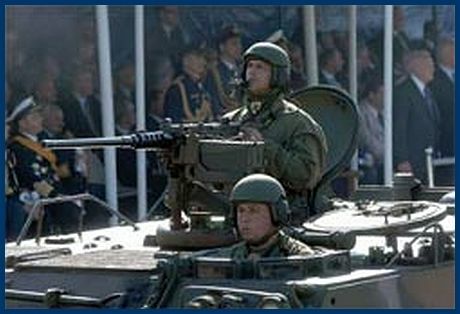 In statements after the end of the parade, President Papoulias said the anniversary was celebrating one of the most sensational moments in Greece’s history, the decision of an unarmed and persecuted nation to rise up against an empire and create the modern Greek state. This same passion had fired Greeks during the Balkans wars and in their resistance to the forces of Fascism in 1940, and would continue to arm the people and the armed forces to repel any attempt against Greece’s territorial integrity, he added. “I am confident about the future of this nation. Of this people that have so many gifts and are ready to make any sacrifice in order to ensure freedom and national independence,” he stressed. Prime Minister Karamanlis, on his part, stressed that it was the struggles and sacrifices of heroes known and unknown, from 1821 until the present day, that had allowed Greece to become free, to modernise and develop and to earn its place on the international scene. A major parade by school children, scouts and ground units of the Armed Forces was held in the northern Greek city of Thessaloniki, with Macedonia-Thrace Minister Margaritis Tzimas representing the government. 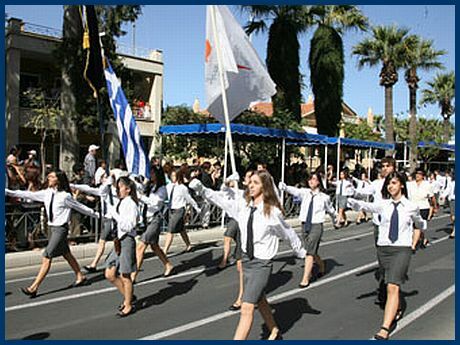 The anniversary was also marked by Greek communities living abroad and in Cyprus, where Cyprus President Demetris Christofias congratulated Greece’s leadership and the Greek people during an event at the Greek Embassy in Nicosia, stressing that the Greek war of independence had been “one of the great revolutions of the 19th century”. Greek Ambassador to Cyprus Dimitris Rallis, on his part, referred to the ongoing Turkish occupation on Cyprus itself, saying that this had to end, and once again reiterated Greece’s steadfast support and assistance to the struggle being given by Greek-Cypriots to achieve this. In a televised address to Greek-Cypriots, he praised the recent agreement between Christofias and Turkish-Cypriot leader Mehmet Ali Talat but stressed that the Turkish side had to demonstrate a constructive attitude so that negotiations for a political solution might resume. Greeks in Australia marked the anniversary with a mass at the Church of the Annunciation, the oldest Greek Orthodox church in Melbourne, and the laying of wreaths at the Shrine of Remembrance in the city. The President of the U.S. sector of the World Council of Hellenes of Hellenes Abroad (SAE) Theodoros Spyropoulos, meanwhile, issued a message that highlighted the anniversary as the supreme symbol of the Greek Nation’s struggle for National independence, as well as a timeless and enduring symbol for the entire world. 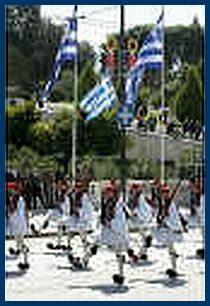 A grand military parade was hosted today in Athens, in honoring and celebrating Greece’s National Day, the Independence Day of 25th March 1821. More pictures will follow tomorrow. Stay tuned! 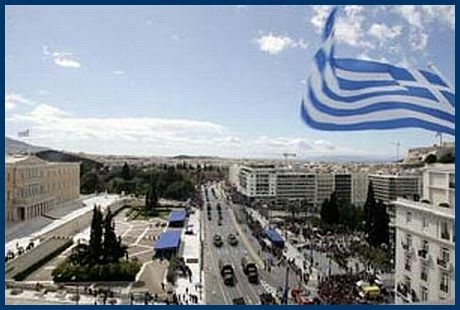 Greeks all over the world observed today Greece’s National Day. Student parades were held in Athens on Monday 24th March, while a grand military parade has taken place today, 25th March, the salute of which was received by the President of the Hellenic Republic H.E. Karolos Papoulias. 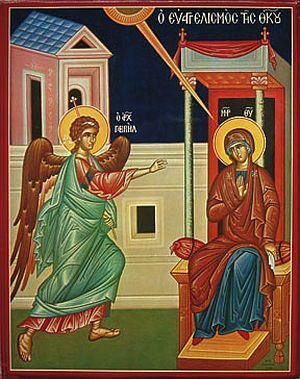 The Greek Nation, today celebrates a dual feast, in respect of Greece’s Independence Day, when the War for Independence was declared on 25th March 1821, seeking freedom and liberty from the then Ottoman empire, and a religious major Orthodox Christian feast, the Annunciation of the Virgin Mary. 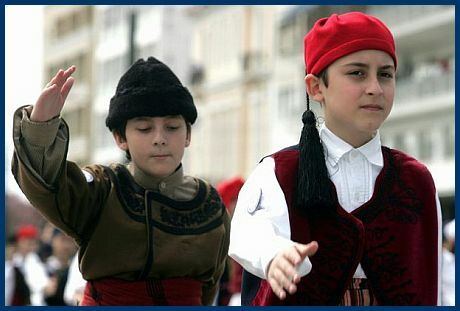 Parades, both student and military, were also held in all towns of Greece and Cyprus. Some photos from these parades follow. 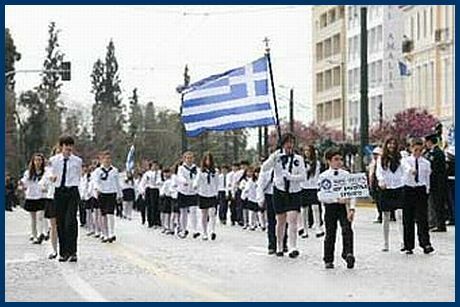 Students parade in Nicosia, Cyprus, on 25th March. Students parade in Athens, Greece, on 24th March. Photos from today’s military parade in Athens, Greece, follow in the next post. Posted by grhomeboy in Editorial, Special Features. 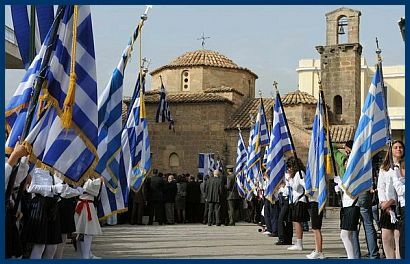 On 25th March Greece celebrates its National Day, the Independence Day, commonly known as the Greek Revolution (in Greek Ελληνική Επανάσταση, Elliniki Epanastasi). 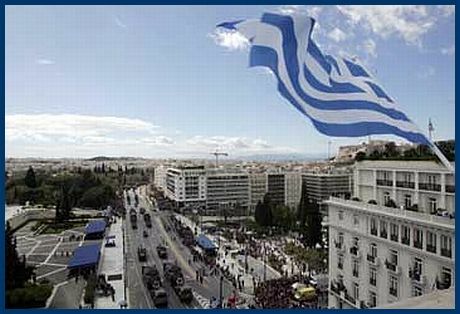 The anniversary of Independence Day (25 March 1821) is a National holiday in Greece, which falls on the same day as the religious Orthodox feast of the Annunciation of the Virgin Mary. 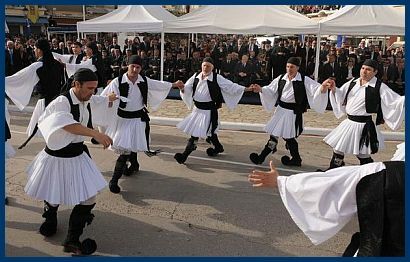 On this occasion, we would like to cordially extend our greetings to all the Greeks, in mainland Greece, in Cyprus and the Greek Diaspora all over this planet earth, our to send our sincerest wishes for a Happy National Day as well as a Happy Name Day [to all the Marias, Panagiotas, Evangelies, Evangelos, Panagiotis, just to name but a few, who celebrate their name day on this major Orthodox Christian feast].